When to sell stock is more important than when to buy. According to Van K. Tharp in Technical Analysis of Stocks and Commodities, April 1999, page 76 when to sell stock accounts for about 10% of your success. The price you buy and sell for in the stock market determines your profit. While you can buy many stocks in the stock market, provided you do not short, you can only sell the stocks you own. The time to get the price you want for a stock depends on your trading time frame, which is influenced by your trading style. The longer you plan to hold a stock, generally the further away from the market your sell stop should be. For instance, a swing trader may sell a stock based on one day's worth of information. A position trader may use weekly data or wait for a signal that the long-term direction of the stock is changing. The stock chart below illustrates this. Let us compare how a swing trader might handle the above trade versus a position trader. Assume both traders purchased Freescale Semiconductor (FSL) on May 9, 2005 at $19.00, which is just above the high on April 26, 2005. The swing trader decides to accept an initial loss of $ 0.25 until a profit is made. The swing trader slowly moves up the trailing sell stop as the price of the stock rises. Ultimately, the sell stop is placed just below the low on May 23 at $20.05. 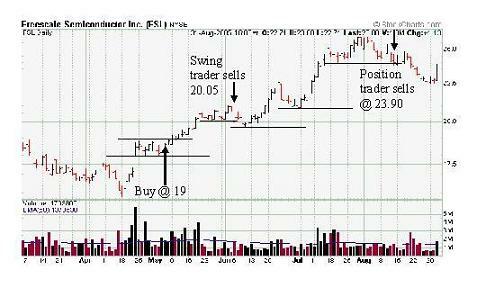 On June 6, the sell stop is hit and the swing trader is out at $20.05. Our swing trader made a profit of $1.05 or 5.5% before commission and slippage in 19 days. Knowing when to sell stock made this trader a profit. The position trader sets an initial sell stop at $17.90, which is just below the low set on May 2. It is decided that the sell stop will only be moved after a new high is hit. The position trader holds on through the dip in early June where the swing trader sold. The position trader is a longer-term trader and needs to remember that when to sell stock is affected by his trading style. After a new high is reached on June 20, the stop is moved to $19.60. The lows seen in the last part of June are above $19.60 and the position trader hangs on. After a new high is set on July 12, the sell stop is moved up to $20.70. The sell stop is again moved up on July 27 to $23.90. Then on August 12, the sell stop is hit and the position trader is out at $23.90. The position trader made a profit of $4.90 - 25.8% before commission and slippage in 64 days. In the above case, the position trader pocketed more profit. However, there are many cases, where the stock weakens quickly and the swing trader ends up making a profit while the position trader loses. Hanging on to a stock during an uptrend is one of the harder skills to learn in trading. To make big gains you need to give up short-term profits but still need to know when to sell stock. However, at some point you need to be able to identify a short-term correction from a change in long-term trend. 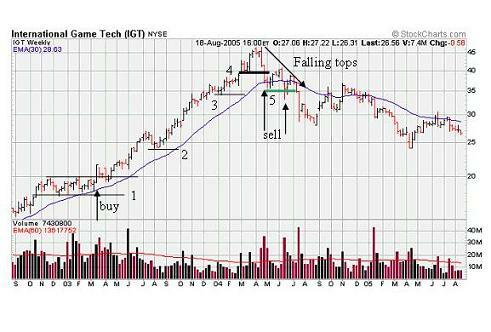 Let us look at a simple example using the three-year weekly chart of International Game Tech (IGT). Say you were fortunate enough to buy just over $20 in mid-March 2003 on the above average volume breakout. Your first stop is set just below the consolidation at $17.95 (point #1). During the July/August 2003 time frame there was about a 10% pull back. This was above your stop. By mid-September 2003, the stock is hitting new highs so you would want to move your stop up to point #2. By early March 2004, after hitting new highs, you might want to move your stop up to point #3, which is just below a small consolidation area. Once the new highs are hit in April 2004, you might think about moving your stop up to #4, which is a consolidation area. If you were lucky enough to move your stop to #4, you would have been stopped out around $38.95 during the week of April 26, 2004. If you missed the stop at point #4, as the slope of the 30-week EMA (blue line) started to flatten out in May, you should have definitely moved your stop up to $35.40 or just below the low of the week beginning May 10, 2004. This stop would have been hit during the week of July 14, 2004. Once you start to see falling tops and flattening long term averages it is best to sell and move on. If you do not know when to sell stock, you shift from being a trader to becoming an investor. Selling is all about discipline. To learn more about discipline and when to sell stock read our discipline section.